Are brand name products superior? I have one case where my opinion is that the brand name is absolutely the superior product and one where I feel the store brand rises to the top. 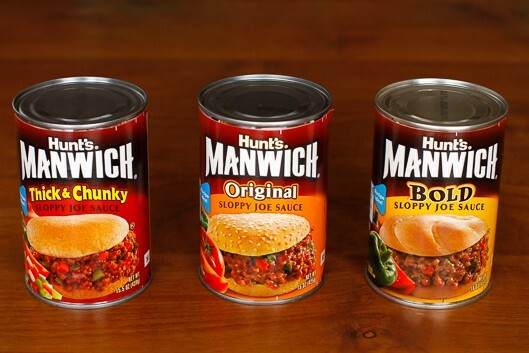 If you're making sloppy joes, it's worth it to spend the extra twenty-ish cents to buy Manwich. 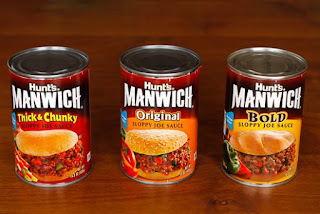 Manwich provides a thick, well-seasoned sauce for your ground meat of choice. If you prefer a vegetarian option, you could even mix Manwich sauce with some beans, corn, and potatoes for a tasty sloppy joe stew. I found the Kroger brand sloppy joe sauce to be thin and overly tomato-ey. Saving twenty cents to buy this product was no savings when nobody wanted to eat it. Conversely, I found that the Kroger seasoned pork loin smacked the Hormel seasoned pork loin right out of the park. The Kroger pork loin was tender and juicy with a well-balanced blend of spices. The Hormel pork loin just wasn't quite right. It came out on the dry side and the "mesquite barbecue" sauce tasted a lot like liquid smoke. It will work well enough in one of my leftover recipe creations, but nobody was keen for it in its first incarnation. Since I'm cooking for just me and my son, I often have leftover pork loin. I have a go-to slow cooker chili which works well with any meat (or without any meat.) It's just one can of pinto beans drained and rinsed, a can of Ro-Tel, a small onion, two tablespoons of chili powder, and about a pound of meat, cooked on low for three hours or high for an hour and a half. For meat that's already cooked, you can reduce cook time on the low setting to two hours. I like to serve this chili either with baked potatoes or with tortillas. The Jennie-O turkey company used to make a delicious pre-seasoned ground turkey for tacos. If you're in Texas, I believe you can still find this product. But not in Colorado. I'm not sure why either. It seemed like it sold pretty well. In any case, I haven't been able to find taco seasonings that compare to their blend, and I'm irritated that they took it off the shelves. I'm starting to think there's a conspiracy with Texas food chains to get Coloradoans hooked on their products and then leave us hanging. Many years ago when dinosaurs roamed the earth, there was a restaurant called House of Pies which served huge slices of the most delicious pies. Their entrees were "meh," but I don't think anyone went there for the entrees. My favorite was the French Black Bottom Pie. Well, lo and behold, one day doom came to Denver and the House of Pies was no more. They're still alive and well and baking pies in Texas, but no more for pie-loving Coloradoans. I found a recipe for French Black Bottom Pie and one of these days I'm going to actually get around to trying it. Somehow, I don't think it will live up to House of Pies glory, but it's highly unlikely that I'll ever wind up in Houston, so it's my best shot.